Though it is now known primarily as a child’s toy, View-Master was launched at the 1939 New York World’s Fair as a way to see the world from home in full-color 3-D images. It was marketed as a more exciting souvenir than a traditional postcard and reels were often sold at tourist destinations across the globe. View-Master reels featured beautiful photography of famous places and people through the 1960s. Medical schools and the U.S. military used View-Master viewers and reels as educational tools, providing educational 3-D images to students of everything from internal organs to fighter planes. In the 1960s, View-Master underwent a change of ownership and became increasingly targeted at children. The reels of that era de-emphasized education and scenic themes and moved aggressively toward entertainment titles focusing on cartoons and popular television programs. Today, View-Master is owned by Fisher-Price and is considered a young child’s toy but the collector market thrives online. Though the look of the viewers themselves has changed over time the reels have remained consistent. Any View-Master brand viewer will show any View-Master brand reel from any decade. Most vintage items are relatively inexpensive, but the price goes up exponentially for rare items. Looking to buy/sell/trade/give away View-Master stuff to a good home? Let me know. 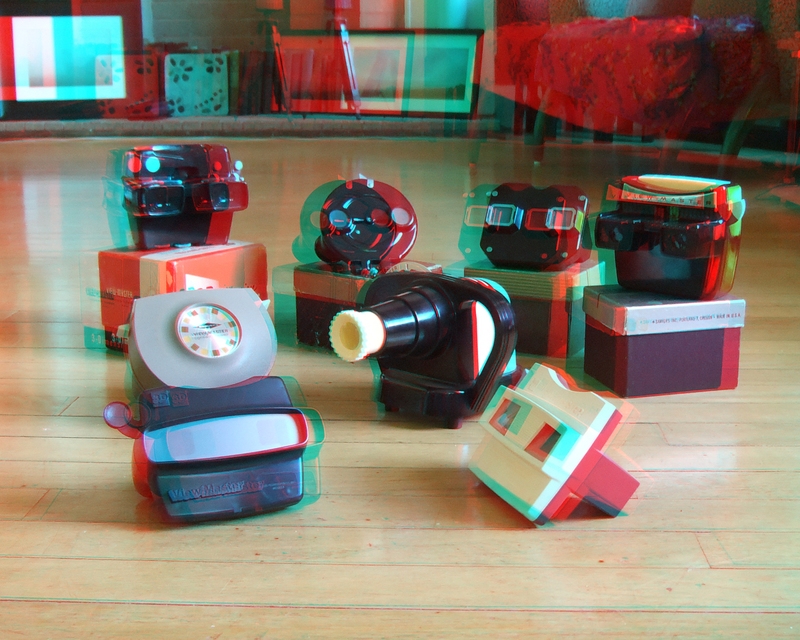 A 3D photo of some of my View-Master viewers. While it promotes itself as an animated, searchable list of individual reels, the best thing about this website is the 360-degree videos of every View-Master brand viewer produced since 1939. This is the most comprehensive visual representation online, featuring 20 distinct viewers and their various attachments. From the earliest “clamshell” style viewer to the brightly colored molded plastic viewers used today, this site has them all. There is also an area to view 360-degree videos of each of the four View-Master projectors available on the collectors market. This website provides not only detailed information on every View-Master branded viewer in existence but a long list of knock-off brands with detailed photos and specifications. The site also features images of rare variants in viewers, such as unusual materials or colors used in production. Most importantly for collectors, it offers detailed specifications on the internal projection and overall quality of each View-Master viewer. The Ultimate Reel List is an invaluable resource. It lists every known reel by logical numeric or alphabetical grouping as well as every known variant in images. For example, due to the View-Master’s many years of production, images were sometimes changed over the years but marketed without changes noted. Just as valuable to collectors, the list provides every known variant of packaging and examples of the various types of packages View-Master employed over the years. The site is hosted by 3DStereo.com but was created by View-Master collector Keith Baird. When Baird died, 3DStereo.com offered to host the site for collectors so his hard work and this beloved resource would not be lost. Adapted from the View-Master Ultimate Reel List. From their site: As there was no official list of titles, this View-Master Database is an attempt to build a complete list of every individual reel, set, and their variants known to have been issued. It is hoped that the site will be of value to collectors and can continue to be expanded in the future. From the site: The aim is to make the most comprehensive and complete list of known variations within the same reel variety. Fisher-Price/Mattel currently owns View-Master and the official site is the place to discover new releases, most of which are for the virtual reality viewers. New releases are limited to children’s titles and education; travel reels have been slowly phased out over the years, finally ending production entirely in March 2009 (though there has been talk off and on over the years, I haven’t seen anything noteworthy in awhile). In early 2013 it was announced that Basic Fun had licensed the View-Master name from Fisher-Price and is producing new products but they are cheap and basically a nostalgic thing for parents and grandparents to buy little kids. The View-Master Resource provides information on creating personal view-master reels. However, it also helpfully provides scans of envelopes and packaging so if a collector acquires a set of reels without the original envelope it came in, they can print a reproduction from a .pdf file and have a copy of the original packaging. Not as comprehensive as a collector might like but it’s a great a resource if a collector has reels that are in great shape but are missing the packaging. View-Masters were often sold in three-reel sets in an envelope that included a booklet that elaborated on the content of the reels. Often these small booklets were lost or destroyed over time and it’s not always easy to find three reels in a crisp envelope with an intact booklet. This site provides hundreds of high-quality scans that allow collectors to see the booklets they might be missing. One of the few print resources for View-Master history and values, this exhaustive guide provides a history and context—as well as a price guide that lists most known reels and approximate values at the time of publication. However, it does not list reel variants. Higher values items are generally rare so this book provides a quick reference for what reels are rare and thus worth the added expense, even if the exact market price is outdated. It also provides a history of the precursor to View-Master, the stereoscope and detailed information on the collectability of stereoscopic photo sets. This is a limited edition book written by the foremost View-Master historians and collectors. This book offers both a behind-the-scenes look at the history of the company from interviews conducted with former employees and detailed information about collecting View-Master products. A huge, expensive, illustrated guide that is up to three volumes, last I looked. This is a members-only group populated with some of the most knowledgeable View-Master collectors in the world. Anyone may join. New members are welcome to search the archive for information that dates back more than 10 years and to ask questions of members to benefit from the group’s collective wisdom. From collectors selling off their massive collections to questions about the right light bulb to get for a vintage lighted View-Master, the ViewMaster and 3D Stereo Group knows everything a collector wants to know. The NSA is a group dedicated to all things 3-D, with an emphasis on photography. The site includes a long list of links for View-Master enthusiasts. The organization’s annual gathering includes a day of selling and swapping 3-D items with some View-Master collectors in attendance. The annual event is a great chance to scoop up or swap items from other members. It is one of the only stores online to specialize in View-Master viewers and reels, as well as 3-D paraphernalia in general. They offer new reels and old, as well as viewers, generally in excellent condition. They also offer hard to find, limited-run View-Master sets that are independently produced. Topics tend to focus on design and architecture and include reels, a viewer and a book on a specific architect or designer, such as Frank Lloyd Wright. It is by far the most popular place for collectors to add to their collections. Ebay generally has dozens of pages of search results offering everything from single reels to large lots, from the common to the completely obscure–even personal reels created by amateur stereo photographers during the product’s heyday. Generally considered the only place to find educational reels produced for the military or medical schools, as well as other older and hard-to-find reels. Online, Craigslist and Facebook marketplace are also good resources. In person, check flea markets and second-hand stores. Who made this? Found online and I love it. Adapted from the Ultimate Reel List, I created a spreadsheet to track my own collection. You can save a copy and track yours, too. I update it regularly with new discoveries, new variants price notes, and other tidbits. If you have red/blue 3D glasses this link is an archive to my 3D photos, some of which have made it onto my personal View-Master reels. If you want to create your own View-Master-style reels, check out Image3D.com. View-Master items, by and large, are inexpensive. Of course, if the item is rare, value goes up exponentially. The best way to find out what your item is worth is to search for it on eBay and check the completed and sold listings in the advanced search functions. Don’t assume anything. The “cool” old bakelite viewers are a dime a dozen because they were produced for decades. But if you have the viewer with the focusing feature (the Model D), you might get a nice return on it. I have been compiling a list of items I’ve noticed are valuable. Check it out here. This pathfinder provides information for those interested in learning more about View-Master products and collecting. It should be of interest to new collectors interested in finding more information on this still relatively small community of enthusiasts. I have 3 sets of sawyers still sealed in pkg “the brothers grimm fairy tales ” from 1955, “hans christian andersens fairy tales” from 1958 and ” guided picture tour of texas” packet # A410 how can i find out what they’re worth? Check eBay. That’s the best indicator of current value. Thank you for all the info you provide here! I have been collecting for a few years, but I’m not nearly as organized about my reels, and I didn’t always keep the blister packaging (which I hate). What do you use to store your collection in? Kelly, I use a combination of containers. For single reels I use vintage plastic containers created specifically for the purpose (you can find them on ebay). For 3-reel sets I have purchased small plastic tubs from Target that fit them neatly but not too tightly. I also use old floppy disk drawers I bought at a garage sale for 50 cents each to store reels. I buy plastic sleeves from an ebay seller to keep individual reels and 3-reel sets in so they don’t yellow. In researching my old Viewmaster and reels from my childhood I realized none of the reel lists I’ve found acknowledge the old Fairy Tale reels put out by Sawyer in the 40’s: FT 1 through 9. They are: Little Red Riding Hood, Hansel & Gretle, Jack & the Beanstalk, Snow White, Cinderella, Goldilocks, 3 Little Pigs, Little Black Sambo (believe it or not), and The Ugly Duckling. I have 3 of them, including the very un-PC #8; Sambo. I have those same stories, must have been a set. Hoping you can please help me find out more info on an item I recently picked up. It is a folder with cards inside that almost appear to be directed to a possible/potential seller. The cards have images of the different view-masters, codes, and store placement for the merchandise guide. I have some pictures but it won’t allow me to post here. Appears to be from the early 80’s. There is no date. Thanks in advance!! I’m not an expert, Andrea but it sounds like it was aimed at retailers. If you’re looking to sell I’d suggest ebay or the view-master Yahoo group. They can also help you figure out the price. I recently bought a vintage sawyers view master viewer. It’s an original Model A with a gold box and divider with lid in excellent condition from 1939. Also has 2 original booklets/instructions. Plus a box of reels from the factory. The viewer is not warped and very straight . Advances excellent. “How should I go about selling it, as I’ve never seen one online like this in 2 weeks of researching” ? I’d put it on Ebay. It’s probably an early model. Search for View-Master Model A or Model B on ebay and you’ll probably find it. What Viewmaster projector would be the best for my 10-year-old autistic grandson? Which has the best picture, easiest to use? I have a 1953 view-master stereoscope in the original box, lid is torn. All the original instructions in very good condition and a dozen slides including 3 slides of baseball stars of 1950-53, Roy Rodgers, hop along Cassidy, Hollywood movie stars, gene autry, Christmas story. Willing to sell. Thank you very much for the good information. I am starting to display all of my View-Master viewers, projectors…I have almost 100 of them. I have lots of duplicate, I also have a few hundred reels, only a few duplicate. If anybody is looking to exchange, let me know. I collect anything related to vintage camera. :) I am working to open my photography museum for June 2017. Thanks so much for the info Rebecca. I have been collecting stereoscopes and photography for a little while now and recently started collecting view masters. I want to do some of my own photography and already am aware of the special cameras and cutters needed for this. I am trying to find out if there are any cutters that are designed more for producing larger quantities or if there is a company you are aware of that will produce larger quantities at a reduced rate. I can’t do $20 for each self promo. Any ideas? I’m sorry, I don’t know much about that end of collecting. There are a couple of Yahoo Groups (ancient idea, I know but they have tons of information if you join and go through their archives). We have a 2 box set of WWII Army Air Force Training Command Reels by Jam Handy Organization Detroit, Mich. Dated 12-1-42 I dont see any reels like this listed on your site. The reels themselves have no writing that they are tests or training reels, just the sleeve states so. The print on the reals are measurements degrees and yards, The Disk number with no other letters such as S or T. There is also the View master black B. We would like to find the value of these and possible sell for an Estate. Owner was a liberator of Mauthausen in the 11th Armoured Division. Awesome list of resources, Rebecca! I was wondering if your google doc collection spreadsheet is comprehensive? As far as I can tell, it looks like it’s got everything on the Ultimate Reel List, and if that’s the case, I’d love to make a copy to track my own collection. Also, I’m assuming the yellow highlighting indicates which reels you currently own, yes? Thanks! Yes, the yellow ones are ones I own. I believe I have made it possible to make a copy for yourself. If not, let me know. Thanks. Are you still interested in buying Viewmaster reels? I have a very large collection of vintage reels. I am! Sorry, I just got your message today. Email me if you still have them! Thanks for your post. I have been an avid collector of all things Viewmaster. Have about 200-250 three pack reels of every genre, in good condition, and want to sell. Can you suggest someone who may be interested? I also have viewers of many kinds. I love ViewMasters and its reels and I am interested in collecting them. I have a Red GAF View-Master from the 50’s and 280 reels, which I have listed. Moste are from 1946 – 1956. I would like to sell the set. Is anyone interested? The delightful thing about View-Master is that the size and shape of the reels have never changed, nor has the basic function of the viewer. The original View-Master single reels were numbered from 4 to 5870; the numbering is not continuous and many numbers in this range were never assigned to published reels. I have extensive view master reel collection and would like to sell. Based on Brad & julie Welsch 2000 value guide my collection is worth $8400.00. I don’t want to piece meal but sell entire collection. Any suggestions on best way to accomplish that? I appreciate your help! I’d post about it in the Yahoo Groups’ View Master group. 8./ #275 Mohawk Trail Mass. Ken, sounds like a nice collection. The reels are all fairly common, however, so I’m not sure you’d get more than $20 for the lot. Hi Rebecca, I’m a video producer working on a series about collectors and we’d love to talk to you about doing an episode on your view-master collection. Could we connect over email or phone if you’d like to know more? Sure, please use the contact form to email me because I don’t want to put my email or phone number on a public blog comment. Thanks!